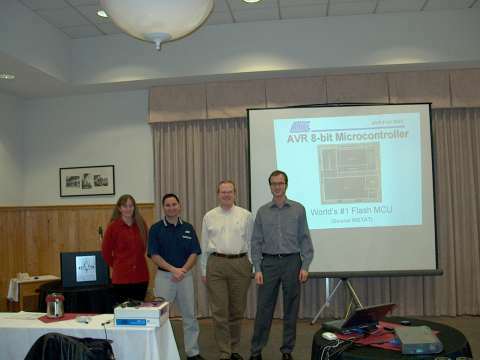 Atmel is hosting a series of seminars for the FPSLIC and AVR till the end of February. On top of that you get to meet the Atmel guys (and girls) up-close and personal and they will answer all your development questions. Check this link for more details on dates and locations. code examples and comparisons for code size between AVR and other mcu's. 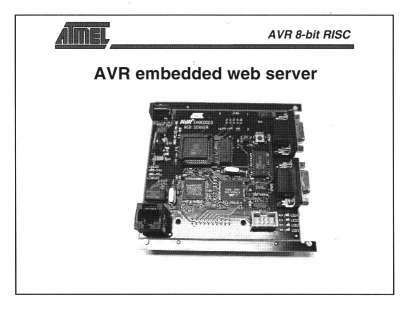 For me the most interesting part was one of the upcoming reference designs which include an AVR embeded web server starter kit. It will provide a low level Ethernet interface, tcp/ip stack, HTTP, FTP ,e-mail support and a file system for storing web pages and data. The web "board" is at production and expected to be availiable end of 1st Q 2001. The other intresting part to existing AVR users is the next generation of AVR controllers. There are going to be "shrunk" versions of the existing parts, with reduced power consumption and improved instruction set. Clock speed is going to double (@5V) and with the added instructions for integer and and fractional multiplication of both signed and unsigned numbers the AVR will be able to replace some DSP designs. The new silicon will also have improvents on existing peripherals including an update external memory interface, which will allow the easier intergration of memory maped peripherals. FPSLIC is a combination of an AVR and an FPGA core in the same silicon, with advanced development tools that allow you to design and verify both the software and FPGA in an intergraded enviroment. The AVR part has all standard peripherals like timers, UART's, 2wire interface, watchdog and I/O and has a 30K static RAM that can be partioned between program and data areas. Since the program is stored into RAM the AVR can execute at approx. 20 MIPS @ 25 MHz. The FPGA can range from 5K gates to 40K and can also access the internal RAM through an allready intergraded memory interface, so that you don't have to waste any of the gates for the memory interface. What i found extremely interesting (except the speed) is that the FPSLIC can be re-configured partial or in total dynamicaly. This means that you can use the AVR to "re-program" either all or part of the FPGA and also change its code "on the fly". As we have been told, there is also an ARM based FPSLIC under development. Very interesting are also the development tools that support FPSLIC. They are FPSLIC "customized" versions of standard HDL development and verification tools. Check the FPSLIC page at Atmel's web site for more info.